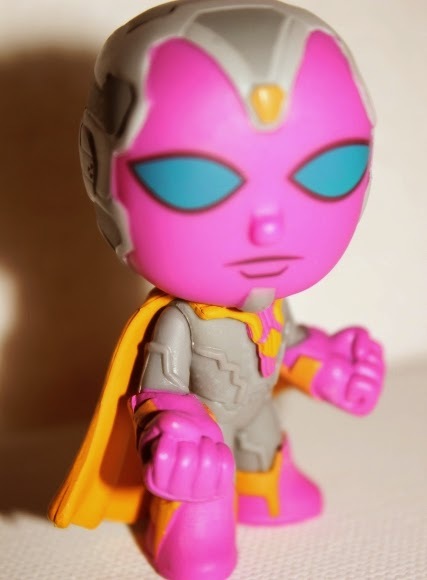 It has taken a few days but I've processed my feelings about Avengers: Age of Ultron (liked it, didn't love it) and am finally ready to talk about the newest addition to my Funko family. 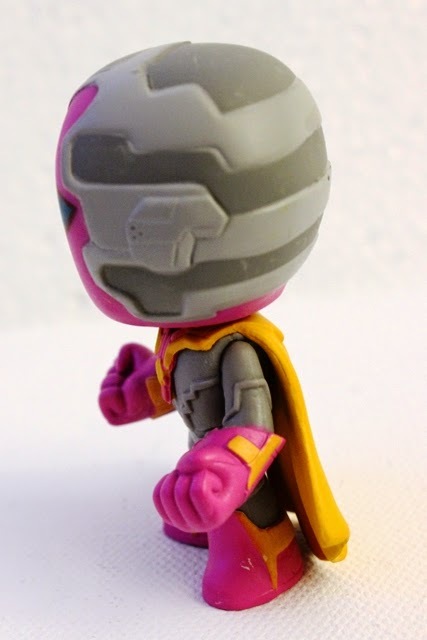 I present you with Vision the Mystery Mini. This toy review will contain spoilers for the film so read at you own risk. You have been warned! Good. Now let's get talking toys. I have a bit of a love/hate relationship with blind boxes. I love that they're a surprise and buying one is basically gambling for children/collectors. I hate them because comparatively they're pretty darn expensive. One of the Funko boxes are usually between $7-10 here, which is only a few dollars less than a Pop. They're smaller, usually not made as well, and it starts to get really aggravating when you don't get the ones you want. I've been pretty frugal (the term is relative) in the past after ending up with 2 Ned Starks, a direwolf, and an Ultron from earlier Mystery Minis, but I decided to give this series a try. I was compelled to take a chance here because I liked the art for most of the figures and there was a 1/12 for everything. 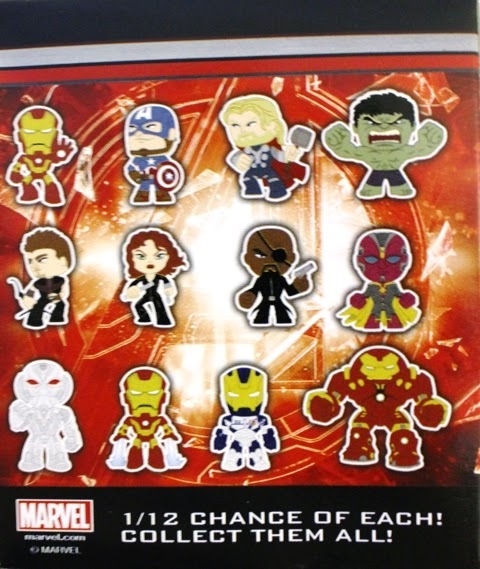 That being said, I was convinced that I'd end up with a handful of Iron Men and none of the ones I actually wanted. 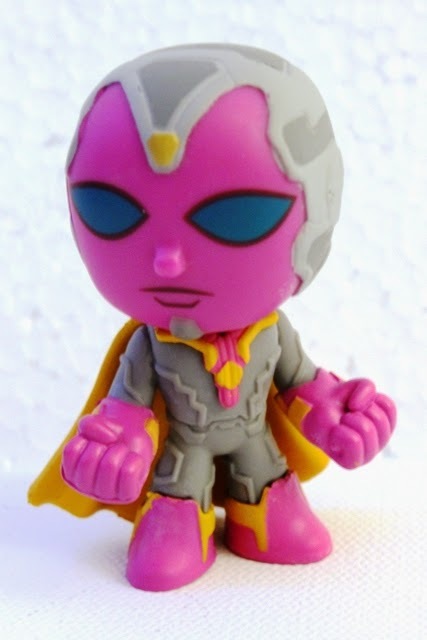 I can't say Vision was one of my top choices, but after seeing Age of Ultron I've changed my tune a bit. Vision (played by Paul Bettany who I enjoy immensely) is created to thwart Ultron's plans by infusing Jarvis' programming into a body Ultron was creating for himself. He's not Ultron. He's not Jarvis. He's something else entirely and I have to say, I enjoyed him. Compared to the first wave of Marvel Mystery Minis, Funko has upped their game. 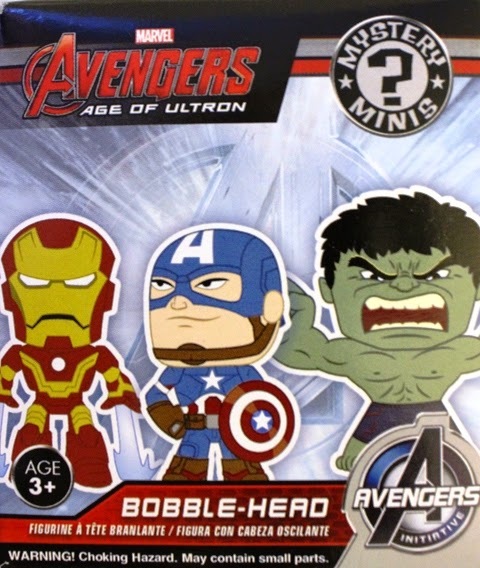 The Avengers: Age of Ultron minis are a bit more substantial. The plastic/vinyl is more solid and heavier. 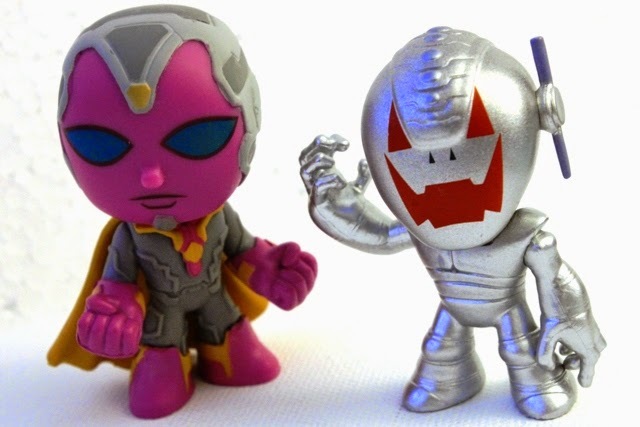 I feel like I'm going to break Ultron every time I pick him up, but Vision has been rattling around my purse for a week or so with no damage. As you can see, Vision is slightly taller too. 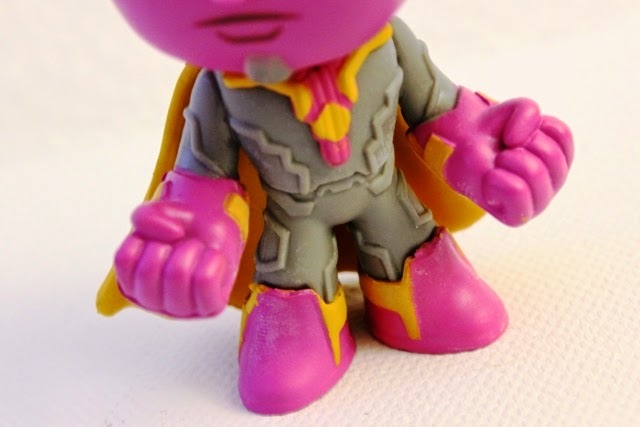 I still think making Vision pink/purple and grey was a weird choice for the film, but i guess taking away the red distinguishes him a bit from Iron Man. The toy's colours are great. The pink/purple is vibrant, the duo-tone greys are nice, and the yellow pops. I like the eye colour but wouldn't have minded if it was a bit brighter. For a small toy, the sculpt is quite intricate. 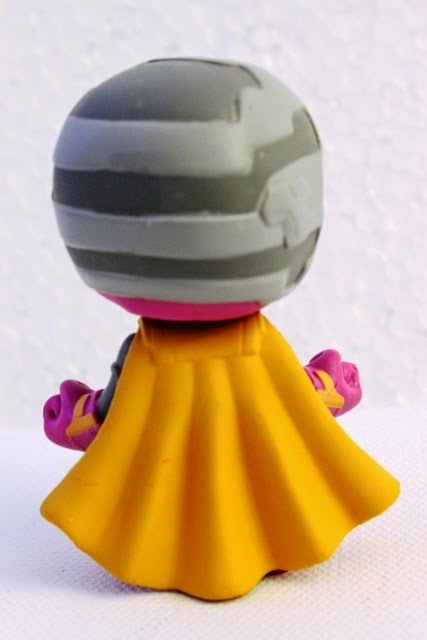 I love the was the cape falls and the detail throughout his head keeps the figure interesting. The tiny stupid nose is adorable. His pose is fierce and strong. I'm surprised they didn't choose something more majestic. Up close, you can see that his suit is molded with a linear pattern to break up the grey. There's a few paint scuffs and some edges that need sanding, but for mini-figure he looks great. His head doesn't bobble much, but that's not really a priority for me. Hell, I almost refused to buy the Marvel Pops because they were bobble-heads...and now look at me. 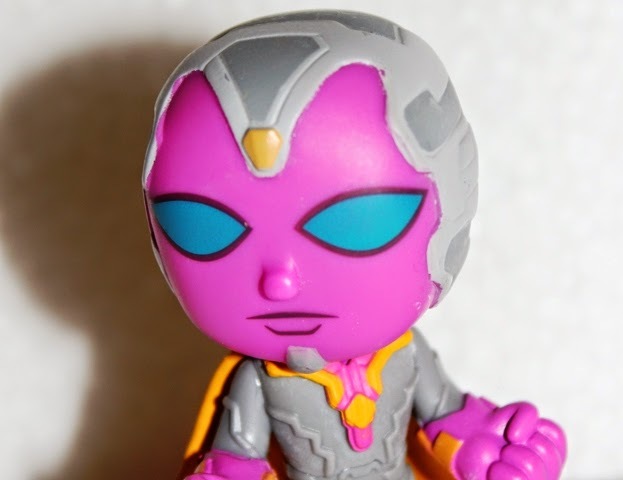 I didn't pay much attention to Vision in the comics. I knew vaguely about his backstory and his relationship with the Scarlet Witch but he wasn't a character that I had any feelings about. I really liked the way they incorporated him into the MCU (infinity gem and all) and I think Paul Bettany did a good job with the screen time he had. 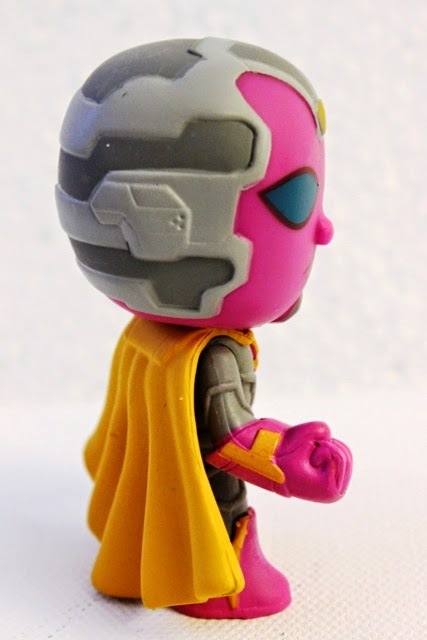 I liked that Vision, though powerful, was a quiet character, reserved, and thoughtful in his speech. In a movie full of characters spouting Whedon-dialogue it was much needed. I bought this mini before seeing the film and I was convinced that it could take the place of a Pop in my collection. Now I'm not so sure. I might just need the full-sized Funko. Damn.